For the past three years I’ve been designing my own Christmas cards for friends and family, usually with some kind of theme linked to my business or interests. 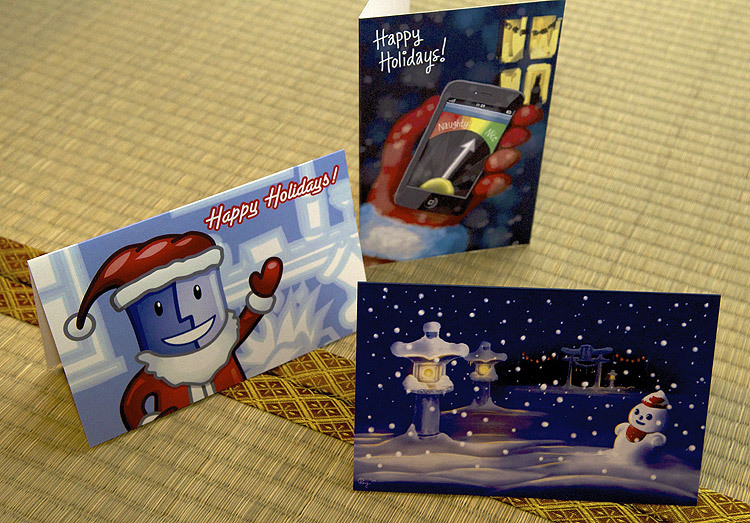 In 2008 I created a Mac Santa themed card, in 2009 I went with a Japanese shrine covered in snow and this year I’ve given Santa an iPhone 4 complete with fictional ‘Naughty or Nice’ app. Such an app may well exist but I didn’t want to be influenced by anyone else’s design so I’ve not looked to see if there is. To go along with the iPhone theme, the card was designed with Autodesk’s excellent SketchBook Pro on my iPad. I thought it would be nice to share all three designs with those who read this blog and hopefully I can inspire some of you to consider making your own cards if you don’t do so already.